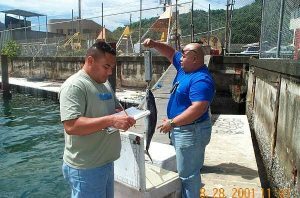 In American Samoa, fishing data are collected by the American Samoa Department of Marine and Wildlife Resources (DMWR) and the NMFS Western Pacific Fisheries Information Network (WPacFIN). DMWR utilizes a boat-based and shore-based creel survey to intercept fishermen and collect both catch and effort data directly from fishermen. Fishermen are voluntarily asked for information on species caught, location, gear, and weather. A mandatory commercial purchase system (receipt book) is also in place to collect information from businesses that buy fish directly from fishermen. This form collects information on the number of fish, weight, price per pound, fishing method, area fished, fishermen’s name and fish imported. The Council produces annual reports on American Samoa fisheries through contributions of data and analyses from the American Samoa DMWR, NMFS Pacific Islands Fisheries Science Center (PIFSC), WPacFIN, and NMFS Pacific Islands Regional Office. In Hawaii, fishing data are collected by the State of Hawaii Division of Aquatic Resources (DAR), the NMFS Western Pacific Fisheries Information Network (WPacFIN). DAR collects commercial fishery data through its Commercial Marine License (CML) program. The CML is required for any person taking marine life for commercial purposes and requires the report of all fish caught regardless of whether it was sold or not. DAR also requires licenses for any CML holder using a small mesh net to take certain fish for use as live bait, fishing using nets, spearfishing, squiding, lobster diving or traps, and for all commercial marine dealers to report their purchase of marine life. This system of dealers and fishermen licenses provides verification of commercial catch data. NMFS collects data in the NWHI Bottomfish fishery through daily trip logs provided to Federal NWHI bottomfish fishing permitees. If the permitee is a commercial fishermen, they are also reuired to fill out NWHI bottomfish trip sales reports. In the MHI, the NMFS also collects non-commercial fishery data through a permit and reporting requirement. Permits and reporting are also required for the crustacean fisheries (lobster, shrimp and Kona crab), precious corals (red, pink, gold, black and bamboo) and coral reef fisheries (for potentially harvested MUS) in the Hawaiian archipelago. The Council produces annual reports on its fisheries through contributions of data and analyses from the Hawaii DAR, NMFS Pacific Islands Fisheries Science Center (PIFSC), WPacFIN, and NMFS Pacific Islands Regional Office. In the Marianas Archipelago, fishing data are collected by the Guam Department of Aquatic and Wildlife Resources (DAWR),CNMI Division of Fish and Wildlife (DFW) and the NMFS Western Pacific Fisheries Information Network (WPacFIN). The CNMI collects data through voluntary offshore creel surveys and a Commercial Purchase System. 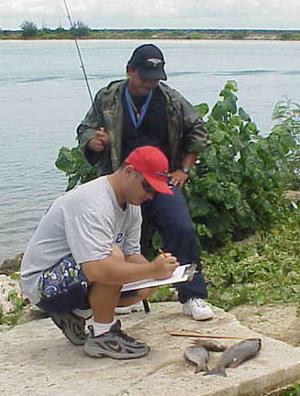 The Offshore Creel Survey collects essential fishery information, such as fishing methods and pounds caught, and provides a census on boats/trailers at the most active launching ramps/docks on Saipan. The Commercial Purchase System in CNMI, known as the “trip ticket” system, collects sales receipt information from fish wholesaler invoices in Saipan, Rota and Tinian. DFW routinely provides and collects dealer invoices that provide information on the dealer, the seller, species, pounds, price per pound and total value. For detailed information, data collection forms, and fishery statistics, please see the WPacFIN website. For more information on data collection in pelagic fisheries of the Marianas Archipelago, click here. The Council produces annual reports on its fisheries through contributions of data and analyses from the Guam DAWR, CNMI DFW, NMFS Pacific Islands Fisheries Science Center, WPacFIN, and NMFS Pacific Islands Regional Office. The Pacific Remote Island Area (PRIA) includes the following islands and atolls: Howland, Baker, Jarvis, Wake Islands, Kingman Reef, and Palmyra and Johnston Atolls. In the PRIA, federal jurisdiction extends 200 miles seaward from the shoreline. The US Pacific Remote Islands Archipelago Fishery Ecosystem Plan (FEP) was developed by the Western Pacific Regional Fishery Management Council and incorporates all of the management provisions of four existing fishery management plans (FMPs)—the Bottomfish and Seamount Groundfish FMP, the Crustaceans FMP, the Precious Corals FMP and the Coral Reef Ecosystems FMP—that are applicable to the US Pacific Remote Islands Archipelago. The PRIA FEP includes regulations establishing marine management zones, protected species provisions and permit and reporting requirements that all foster data collection, monitoring and enforcement in this remote region. Although pelagic fishery resources play an important role in the biological as well as the socioeconomic environment of the US Pacific Remote Islands Archipelago, they are managed separately through the Pacific Pelagic FEP. The marine ecosystem and habitat surrounding these islands are considered some of the most geographically isolated in the world. These islands were formed through volcanic activity and consequently have steep drop-offs to the sea floor. Each of these islands has relatively little habitat suitable for sustaining a large benthic-associated marine biomass, but do have rich a history of fishing and use. Commercial and recreational fishing for coral reef, crustacean, bottomfish, and pelagic species have occurred at varying degrees in the PRIA. In 2006, President G.W. Bush established the PRI Marine National Monument (PRIMNM), which generally extended from 0- 50 nautical miles around each of the PRIA. In 2014, President Obama expanded the PRIMNM to the outer-boundary the US EEZ around Wake and Jarvis Islands and Palmyra Atoll/Kingman Reef. Commercial fishing is prohibited in the PRIMNM, whereas non-commercial and recreational fishing is allowed, but subject to permit and reporting requirements. Fishing regulations applicable to the PRIA can be found at 50 CFR 665 subpart E and 50 CFR 665 subpart H.